Discussion in 'Disney Collectors Board' started by Wander Trico, Jun 1, 2018.
i went to a convention recently. it was super fun, every one cosplaying and lots of fandom merch for sale. i also learned that disney pin trading is apparently HUGE. like there were some booths that only sold disney pins. it made me want to start collecting too. so i'm like super new into pin collecting. i was hoping i could get a few tips. where are some good places to get pins? yes i know the absolute best places are at the disney parks, but they're so far ahaha. i was thinking more online purchases. is ebay decently safe? i know fakes and scrappers are an issue. Sounds like you've answered your own question with your concern. Collecting pins is like collecting POPs. You can turned around and realize you've somehow dropped thousands. And it's not an investment. Be warned. Ebay can be fine. It depends on what you're buying and from whom. But that means doing a lot of research. It's generally the common sense rule that if it looks too good (cheap) to be true, it probably is (fake). And seller ratings mean nothing. There are many known scrapper sellers with 100% positive ratings and thousands of reviews. Like many things on eBay, you'll get the best sense of the prices by looking at what has actually sold. Those numbers will be much lower than what sellers are asking. It will also give you a sense of how much inventory is out there per pin and whether someone else will probably post it soon. Sometimes they'll make 10,000 of a pin and sometimes they'll make 250 and that makes a greater impact on the price than which character it is. And whenever there's a whole bunch of the same pin available from Hong Kong, those are the fakes. The safest thing for those of us who live nowhere near the parks is shopdisney.com. That's Disney's own merchandise website. They only sell a fraction of the pins there, but it's a start. There are some really useful Facebook groups. There you can ask questions, observe discussions, and even connect with reputable sellers and traders. If you're not going to the parks regularly, it's extra expensive to get started because you won't have anything to trade with. But you're already referring to it as pin collecting rather than trading, so that's a good mindset. I would recommend getting sealed mystery pin packs/bags from ebay. Sometimes you can get those at a discount from how they are priced by Disney in the parks and you don't have to worry about whether they are fakes/scrappers. My husband and I paid around $60 for around 30 pins prior to our last trip. This was a good starting point for trading, whether you want to trade in parks or online with other pin collectors. As a general rule, if the pin is less than $2 or $3 dollars, it's likely not real. Good point! I love the mystery bags! hi cadien, thank you for all the helpful advice. especially those websites, they seem like great resources. it's a shame that ebay's feedback isn't really helpful for detecting sellers who r known to sell fakes and scrappers. i really don't know what else to go by. yeah if it's too cheap then it's too good to be true. but being that i had just started, i don't know what's cheap, what's expensive, or what's reasonable. thank you elizabeth smith, so if it's less than $2 or $3 it's fake? most of the pins that i've bought are around $10-15. from googling i found a few tips on how to detect scrappers. none of the pins that i bought seem like super obvious scrappers. paint doesn't have dimples, edges r smooth, they have disney logo on the back, don't have stinky chemical smell, they aren't magnetic. it could be that i'm still new and don't really know what to look for, but i think most are real? unless every ebayer i bought from so far just make really good fakes. after you showed me those sites though, i do think some that i bought are fake. on shopdisney, the jessica rabbit pin is like $12. yet they sell it on ebay for $9.99? how do they make money? and another pin i looked at on pin pics, they said that all the pins from the mickey's gears series r common fakes. like each pin is limited edition 250, so if you see a seller sell a pin like that every week then it's probably fake. it is true that after i bought my pin, that ebayer posted another listing of the same pin right away. i guess it's a learning experience though. and i don't plan on trading these fakes/scrappers at the parks so i guess it's fine. whether it's real or scrapper, it still will look cool decorating my cork board. The reason ebay sellers can sell fakes and still have high ratings is that most buyers don't know when they're getting fakes. Some are incredibly hard to detect and you have to know to look in the first place. $10-15 is pretty average for pins. That's a good starting point. Until you get into the limited edition ones. The best way to know cheap/expensive/etc is to check ebay's sold listings for what it has gone for in the recent past. Frankly, if you're buying for your own enjoyment and not to trade or sell, it's less important whether they're fake. (Controversial statement.) If it looks nice on the wall, it looks nice on the wall. As long as you're not knowingly doing it. That's where the ethical issues come into play. Your experience with the gears is a good one. Any time a seller has that same LE pin already in their sold history, it's likely fake. Also when they're posting an image rather than an actual picture. Like from the flyers or the Disney website. It IS possible for someone to sell a real $12 pin for $9.99. Disney puts their overstock in their outlet stores for even less than that and people buy them up to resell. Also cast members get a discount and then (against the rules) resell. So that isn't something to worry about authenticity-wise. There are of course also people who shoplift to resell, but there isn't any way to identify which sellers those are. Thank you for all the helpful tips on pin prices, i'll be sure to check the sold listings more often. oh good, so the $9.99 pin could still be real. i was like, well maybe they got the pin for free by trading it at the park and are now selling it? but all those other possibilities you mentioned make way more sense. $10 per pin is not bad individually but it racks up fast lol. yeah, i learned a lot from this experience. i google searched good/bad ebay sellers for disney pins. I found 2 separate lists of bad ebayers who r known to sell fakes n scrappers. The seller i bought the mickey gears pin was on both the lists. i know it doesn't really matter if it's real or fake since they're both just going to sit on my wall and look cool. fake mickey gear pin still goin up on my wall anyway. but i still want to buy authentic pins and try my best to spot fakes because 1) if it's for the same price as an authentic pin then it freakin better be real and 2) i don't like the idea of my money going to a person who makes a living out of deceiving people. 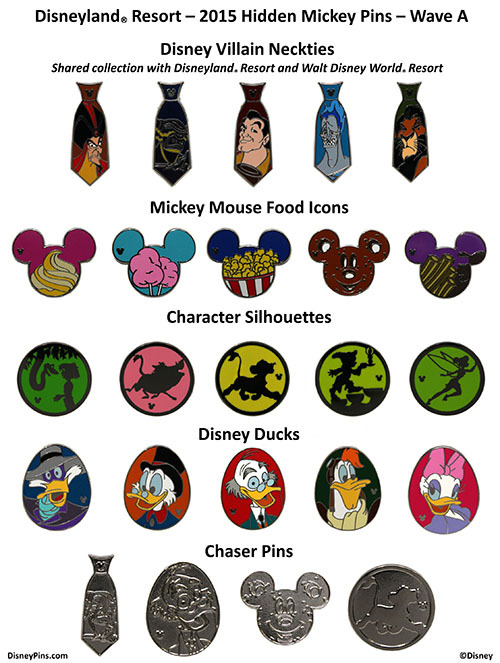 I bought some disney pins on e-mail (very ugly ones are cheaper) and then traded them in WDW. No one wants to try the ones they like so I try to find good deals on the ones I don't like, usually bulk deals like pack of 50 are the cheapest. I have bought some pins in WDW but those are to keep as one pin can cost as much as $15. my first pin i bought at comicon. the vendor told me that she got it from her friend who works at disney and that's a pin only disney staff can get. after researching which pin it is, i found out it's a hidden mickey pin. what are hidden mickey pins? and are hidden mickey pins rare? Thank you for the suggestion motherof5. The bulk deals on packs of 50 are usually the fake ones though. They aren't rare. You can buy authentic ones from people on Facebook or eBay for $3. They're the ones that Disney makes to go on the cast member lanyards and then be traded with guests. So they're smaller and cheaper and of simpler designs than the pin they sell in the stores. They release them in themed sets so people take the extra effort to go around and collect them all. Usually each year they'll release about four or five sets of six. And one or two of those sets will be unique to WDW or to Disneyland. So there will be like three sets that both parks get and then they'll each get two unique ones. Those are also the pins that are put up on the official pin trading boards in the parks. Because they are such basic designs, they're quickly counterfeited and those are the ones that get sold in bulk on ebay and amazon to people looking for something to trade in the park. Here's an example that might help. Both parks got the neckties. The other sets were unique to Disneyland or to WDW. 'Wave A' is because they did these for the first six months of 2015 and then released new ones for the second half of the year (Wave B). Oh and they're called Hidden Mickeys because each one has that little icon on them. Oh i see. The vendor made it sound rare like u can only get them from staff members. i guess that's true that you can only get them by trading with staff, but it's not that rare if they make a million of them for both parks. makes sense now why the hidden mickey pins i saw on ebay were so cheap. Not always you have to read the ones that say guaranteed disney trading pins. Those ones Disney will trade. I did it in our last 2 trips. disney staff have to trade pins that have the disney logo on the back. just because it has the logo does not mean that it's real. 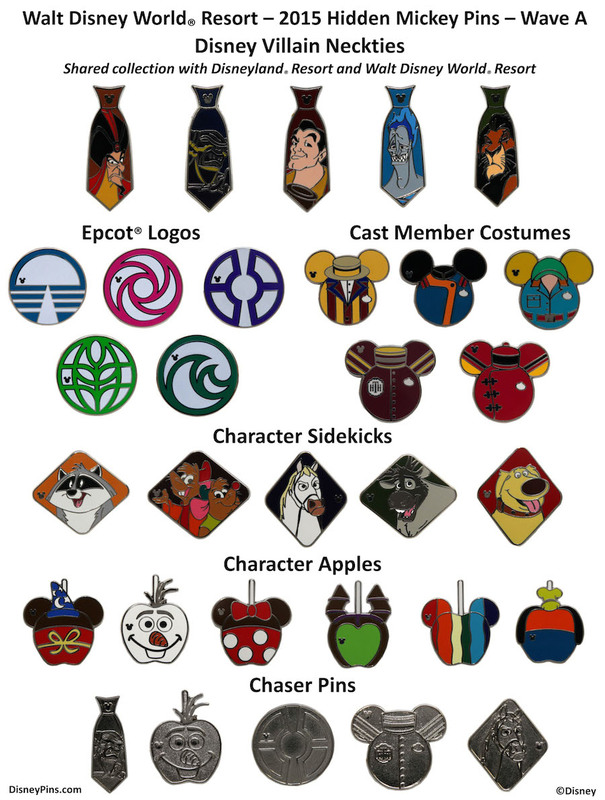 a lot of these ebay listings for fake pins say "100% trade-able" because technically that is true. Exactly. Staff are required to accept fakes in trade. So then the next person trades away a pin they paid real money for and gets the fake in return.